A perfectly typical set of four French pure linen dish towels or "torchons." These hearty towels are loomed of of a very tightly woven and weighty ecru linen and bear a single classic thick red stripe down either side. 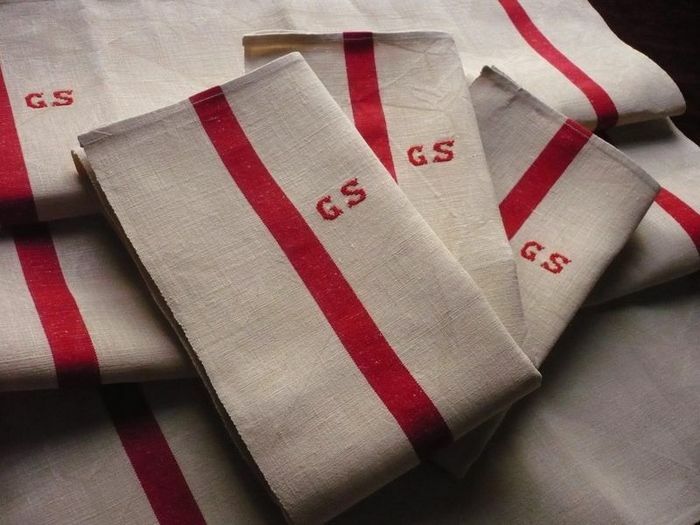 A small monogram, "GS," is embroidered in red cross stitch in one corner. These lovely towels likely date from the early to mid 20th century but are in brand new, never used condition! (There are two more identical sets of four towels available on demand.) Dimensions: 30 x 23in.